The Gloster Sparrowhawk was a British single seat fighter aircraft of the early 1920's. A development by Gloster Aircraft Company of the earlier Nieuport Nighthawk fighter, 50 aircraft were built by Gloster for the Imperial Japanese Navy, with a further 40 being assembled in Japan, being operated from 1921 to 1928. 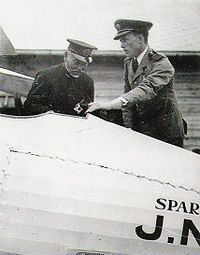 Warbird Picture - Captain Sempill showing a Sparrowhawk to Admiral Togo Heihachiro, 1921. When the British aircraft manufacturer Nieuport & General closed down in 1920, the services of its chief designer, Henry Folland were hired by the Gloster Aircraft Company, who also acquired the rights for Nieuport's Nighthawk fighter, a promising design that had been ruined by the use of the unreliable ABC Dragonfly radial engine. Folland used the Nighthawk as the basis for a series of development known as the Gloster Mars series, with both air racer and fighters being produced. When, in 1921, Britain sent the Sempill Mission to Japan to allow the Japanese to develop a Naval Air Arm, Gloster was able to meet the requirements of the Imperial Japanese Navy for a single seat fighter by a modification of the Nighthawk. The resulting Sparrowhawk was made from existing stocks of stored Nighthawk components, but replacing the Dragonfly with the Bentley BR2 rotary engine, allowing Japan's order for 50 Gloster built aircraft and a further 40 in component form for manufacture at the Yokosuka Naval Air Technical Arsenal to be quickly met. Of the 50 Gloster built Sparrowhawks, 30 were Sparrowhawk I land based fighters, 10 Sparrowhawk II twin seat advanced trainers and the remaining 10 completed as Sparrowhawk III shipboard fighters. The Sparrowhawk IIIs, which were similar to the 22 Gloster Nightjar carrier fighters produced to operate from the Royal Navy's aircraft carriers, were fitted with appropriate flotation equipment and arrestor gear.. The 40 Yokosuka assembled aircraft were completed as Sparrowhawk Is. The Sparrowhawk entered service with the Japanese Navy in 1921, with the 10 Sparrowhawk IIIs being used for flight training operations from ramps built on one of the gun turrets of the Battleship Yamashiro, as the carrier H?sh? was not yet ready. Although used for training from the Yamashiro, the Sparrowhawks were never operated from the H?sh?, with it being replaced for shipboard operations by the purpose designed Mitsubishi 1MF fighter before H?sh? entered service. The Sparrowhawk continued in service from shore bases until 1928, when it was retired from use as a trainer. Also known as Mars II. Land based fighter. 30 built by Gloster, with further 40 assembled in Japan by Yokosuka Naval Air Technical Arsenal. (Mars III). Two seat trainer. 11 built. (Mars IV). Single seat carrier fighter. 10 built. * Two fixed forward firing .303 in Vickers guns. 1. ^ Mason 1992, p.152. 2. ^ a b c Johan Myhrman. "The Sparrowhawk Ship Born Fighter - Brief history of the Sparrowhawk". j-aircraft.com. http://www.j-aircraft.com/drawings/johan/sparrowhawk.htm. Retrieved 2007-08-09. 3. ^ James 1971, p.75. 4. ^ a b Green and Swanborough 1994, p.241. 5. ^ Jackson 1973, p.335. 6. ^ James 1971, p.90. 7. ^ a b James 1971, p.79. * Green, W; Swanborough, G (1994). The Complete Book of Fighters. New York: Smithmark. ISBN 0-8317-3939-8. .
* Jackson, A.J. (1973). British Civil Aircraft since 1919 Volume 2. London: Putnam. ISBN 0 370 10107 X. .
* James, Derek N. (1971). Gloster Aircraft since 1917 (First ed.). London: Putnam. ISBN 0 370 00084 6. .
* James, Derek N. (1987). Gloster Aircraft since 1917. London: Putnam and Company Ltd.. ISBN 0-85177-807-0. * Mason, Francis K (1992). The British Fighter since 1912. Annapolis, Maryland: Naval Institute Press. ISBN 1-55750-082-7.